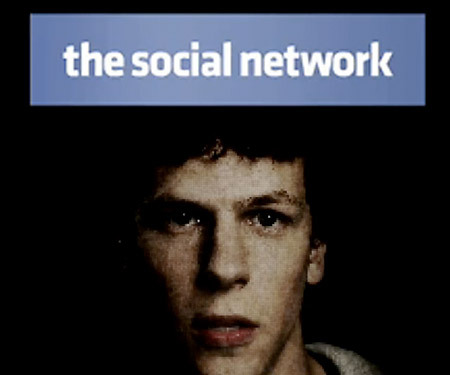 Considering the previews, as well as the fact that it arrives in a period of time for some reason worse for the quality of movies in the United States than the Franco dictatorship in Spain, I’m not sure that anyone is expecting The Social Network to be good. In case though that there was still anyone eager for Aaron Sorkin’s “Network” to exit beta and be released into theaters, I should say: keep your anticipation close to the chest, because the movie is going to be uncomfortable. Although Sorkin can script a better walk-and-talk than anyone, he will not be able to pull off the walk-and-tag-a-photo. Which isn’t his fault, he never had a chance, as the story toes to the neck violates the On & True one-back rule. The one-back rule is simple, but not simple minded: the “present day” that any movie, song, or tv show lives in cannot contain any of the most recent details of our (listener land) real present day. Instead, the “present” of these entertainment products must be lagged by at least one time period. If the one-back rule isn’t followed, we get confused. Some examples. Movies and TV shows released today should never mention the bad economy. They have to lag their crises by one; so they can talk about the War in Iraq, or 9/11, but all things recession have to be saved for the sequel. If New Orleans comes up in passing dialogue, your protagonist can mention Katrina, but not BP or the oil spill. You can talk about Clinton, but not Bush. And in terms of technology, your characters can text and email at ease, but when they tweet or tag or mention a video they saw on youtube it just sounds weird (but maybe if they’d autotune it…). It all centers on keeping our present and the faux-present of the piece definitively separate. Because in order to suspend disbelief and be awed or obsessesed or provoked of thought, their world needs to stay behind the screen (or the music) and we need to stay in our seats. When Lil’ Wayne says that some girl is “down like the economy” I’m always like “wait, there’s a simultaneous recession in Lil’ Wayne’s world (not the part of NYC where people from Wayne’s World all live and work)?” Once you realize he’s here with us, it’s just like,, he’s out a damn mind. And if you want a pure Action movie with no political overtones you have to follow the one-back enemy rule. You can’t be fighting Iraq, or North Korea, or Afghanistan, cause you’re bound to make a blackwater reference and make things too political. To make an action-only movie you have to fight one-back:: Russians! Imagine if Taylor Swift started singing about falling in love through texts. “People text in fairytales too?” shiiit. Not to mention it in two consecutive posts, but making You've Got Mail today would've been all good. Email is now fair game. Facebook though is still the newest piece, and so plotting a story around Facebook is going to feel awkward and a little too familiar. just like mark zuckerberg. agree to some extent, but at this point Facebook is seven years old, is that far back enough? Especially in a time when media zeitgeist is very rapidly exchanged for the next new trend. I'd consider a Twitter film a violation of "one-back," but at this point Facebook has a substantial foothold. 1st-Generation Facebook users (myself) are now in mid-to-late twenties and it's pretty ingrained as an institution. I'll eat my words if it bombs, though, I promise!